In this day and age, queer identity is more important than ever. Or is it? In Sebastian Robinson and Tamara Natt’s Alpha, the two explore the idea of what modern day queer identity looks like - and if it actually exists. Through poetry, movement, music and sound, the two create a world where the roles we choose to take on in life are revealed and questioned. Robinson and Natt appear on an empty stage, dressed in matching white shoes and black tracksuit outfits. They spend the next 50 minutes creating some beautiful visuals for us not only through their soft and fluid movements and exploration of the space but also through their words. 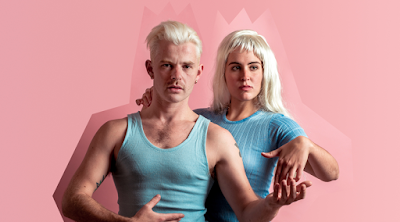 From a Britney Spears song to an Auslan interpretation of a Delta Goodrem song to one of their original works of poetry, Alpha shows how words can do so much to an environment even when you are staring at an empty stage. Sound designer Milly O’Sullivan, is also on stage with the two performers, creating a live soundscape with her guitar that manages to quietly nestle its way into your mind. Whether it be accompanying poetry being recited or a scene acted out or bodies moving on the stage, O’Sullivan’s sounds heighten every emotion and thought the audience are invited to experience. At times however, I felt there was so much happening with Alpha on stage and subsequently in my head, that it was difficult to fully grasp and appreciate all the ideas that were being presented. Perhaps this is the point that Robinson and Natt are trying to make with Alpha. Maybe there is no such thing as queer identity. Maybe the concept is too big to grasp. There is no constant in the world so maybe we only need to be aware of our own personal identity to love and be loved. Either way, it’s worth your time seeing this show and coming to your own conclusions.